This event is going on a bit outside of the Lehigh Valley, but the local ties and awesomeness of the it are totally relevant to our interests (and yours, too). Chef Lee Chizmar of Bolete in Bethlehem will be doing the cooking at Outstanding in the Field when it stops by Eckerton Hill Farm in Lobachsville, PA. What is “Outstanding in the Field” you ask? Well, it’s pretty simple. A team roves the country hosting pop-up dinners everywhere from caves by the sea to horse stables to fields. They take a notable chef from the region and have them use the most local and fresh ingredients possible to feed 130-200 diners at one long, expansive table. 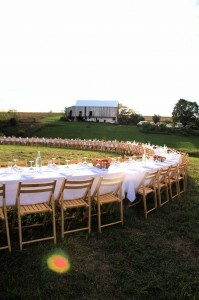 Eckerton’s past Outstanding in the Field dinners have been held in a beautiful field overlooking a vista of greenery. A reception spiked with wine allows diners to take a tour of the farm and learn more about the ins and outs of what the local agricultural producers do. The chefs use an outdoor kitchen to prepare appetizers and four courses while local producers, farmers, and artisans discuss the products being used in the food you’re eating. The caliber of Chef Chizmar’s cuisine, paired with the local aspect and complimented with the novelty and view that you get sitting in the field? Unparalleled, we can only guess. This year’s Eckerton Hill Farm Outstanding in the Field dinner will be held on September 24th. Tickets are $200 and go on sale March 20th. Grab them fast because dinners are known to sell out quick. Got some time? Check out this video from Eat TV of a dinner at Eckerton a few years ago.